how much can a koala bear? The event that might have rivalled my sister’s wedding in appeal fortunately happened the morning after. Walking in the direction of breakfast we crossed paths with my uncle and aunt, who advised us that Dad and co. were sitting at the garden tables watching the koala. We picked up the pace pausing only to be disappointed as we passed the non-functioning coffee machine, resorting to instant coffee to carry out with us. The koala, which at first I couldn’t see obliged by moving and draping itself over the limb of the Casuarina (she-oak tree) where it was soaking up the sun over the beach, and becoming visible. After breakfast we walked down and snapped a few pics of the only koala I’d ever seen in the wild. Life’s good, mate. Too right. No worries. After which the G.O. and I did a circuit of the beach. Upon returning, at the tap washing the sand off my feet I saw a lump move in the tree above me. The koala was on its descent, it was lunch-time so perhaps looking for a snack in one of the neighbouring eucalypts. I sat where I was, the G.O. a little further back. The koala paused, settled, regarded me, and resumed its downward path. On the ground it gave me a glance then moved toward a slender gum about 2 metres away, and ascended almost to the top where it paused, ate a few leaf tips, ascended further and settled. 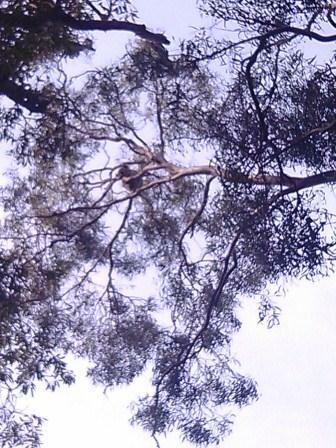 On Sunday morning the koala had moved from where we’d last seen it, and nor was it the she-oak. Eagle-eye G.O. spotted it nearby in a different eucalypt, luckily as we’d been about to walk adjacent to it to return to the hotel, just as the koala made its presence known to me by taking an elevated pee. If I was a koala living on the shores of Salamander Bay at Port Stephens, I wouldn’t move far either. As they say in real estate… location, location. This entry was posted in Blog and tagged Australia, koala, nature, Port Stephens, Salamander Bay, travel. I have spent a lifetime prompted by ‘koala’ road signs fruitlessly peering at gum trees… And, no I wouldn’t have liked to have been directly below. What a fantastic treat to be so close when it’s the first wild one you’ve seen. That was a real ring side seat. Not being an enthusiastic zoo, etc goer my overall exposure to koala’s has been very limited, so this was very special. Great slide show — It shows how vulnerable they are on the ground. Have you heard the noise they make? They might look cute and cuddly, but not their call. It sounds rather unearthly and must have scared the bejesus out of the early white settlers. Ella, Thank goodness your story was a happy one. When I saw the title, I nearly didn’t read your post as I thought it was going to be about the horrid destruction of koalas habit. I have seen so many shows on tv about it, it makes me sick. Especially when they cut down Blue Gum plantations and just let the koalas die. Good news week here… actually it’s not very often I do a rant. This koala looked very at home but I know that’s not the case in areas where money talks… and I’m sure to the proliferation of residential development has impacted the local habitat significantly. Love your photo series and you did not need a ‘fancy’ camera to pass on nature at its best! I also thought it would be about the hardships ‘civilization’ has brought on the dwindling koala population so it was great to meet one of the contented locals! Hope you will get a chance to meet again 🙂 ! Way back my marital family owned an apple farm in Bilpin, Blue Mts – much of it rather steep had to be left as natural bush . . . it was lovely for my daughters to grow up seeing the animals part of nature . . .
One of the great benefits of smartphones is the camera, used in moderation – not every moment needs to be recorded – although my current model is sadly lacking in quality, but it did well enough. The G.O. said that koala isn’t a youngster, so I hope it’s part of some type of koala community. Despite seeing native animals like wallabies, and birds regularly I never tire of it, and everyone there were excited to see a koala. Next time we go to Soldier’s Point we’ll stop in and see if it’s there. What a cool little guy. Fascinating to see how a koala moves – I had no idea they have such a long reach. Great captures. Thank you. 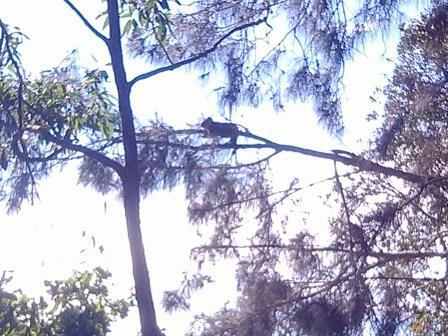 Previously, I’d only ever seen it on TV, so it was very cool to see a koala doing its thing for real. On my visit to Oz in 2002, the couple I stayed with took me to the local wildlife park, where I had my photo taken a koala called Sidney. Sounds like you had a lovely encounter 🙂 I thought the koala we saw looked small but when I was closer it was pretty big, and heavy I imagine. To hold one would be unforgettable. It’s lovely to hear from you 🙂 Blogging is like knitting you can put it down, pick it up again whenever, and it’s fine. Have dear friends in Sydney so hopefully I will get across the pond sometime to your side of the world and am looking forward to seeing Oz beasties – and sharing that experience with my kids!